Windsor Hills is located just off of Highway 192 on Old Lake Wilson Road (Route 545 south) in Kissimmee, Florida. Approximately 1.5 miles from Disney World and also within 20 minutes from Universal Studios, Sea World and the Orlando Convention Center on International Drive. Take 528 West (Beeline Expressway) to I-4 West toward Tampa. Continue to US 192 West (Exit 64). Take US 192 West 1 mile to Highway 545 (Old Lake Wilson Road). Turn left onto Highway 545. The resort is approximately one quarter mile ahead on the right. Exit onto Red Cleveland/Lake Mary Boulevard. Proceed west to I-4 West toward Tampa. Take Exit 242 (Highway 192), turn left (west) at the traffic light. Proceed 15 miles to Old Lake Wilson Road. 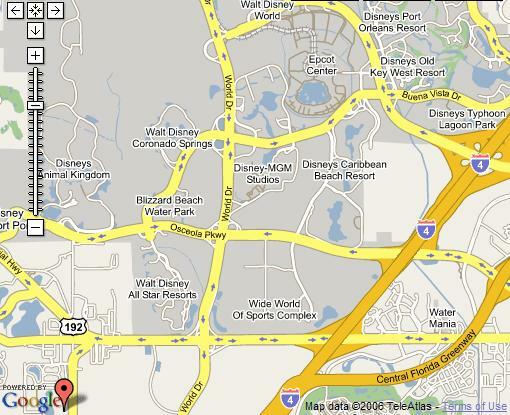 Take Exit 259, I-4 to I-4 West, Exit 64 (Highway 192 West/Magic Kingdom-Disney World). Continue to the third traffic light (Old Lake Wilson Road). There are numerous restaurants, fast food eateries, discount department stores (Walmart and Target Super Centers), supermarkets, souvenir shops, fueling/convenience stores and entertainment complexes on Highway 192.